Are Climate Physicists Copying Van Gogh? Dedicated to the mystery of Vincent van Gogh’s death, watching the first fully painted movie, ‘Loving Vincent’, is a truly enchanting experience. IBS scientists created their own interpretation of Van Gogh’s art, where oil color brushes are replaced by contour lines of atmospheric flow simulated on a supercomputer. ▲ Figure 1Time-evolution of a pair of computer-generated hurricanes circulating over the Indian Ocean and interacting with a meandering westerly wind jet. The title ‘The Stormy Night’ was inspired by Vincent van Gogh's masterpiece, ‘The Starry Night’. Entitled ‘The Stormy Night’, in reference to Van Gogh’s masterpiece ‘The Starry Night’, the image is part of Daejeon’s IBS Art in Science exhibition 2017. Featuring more than 30 images created by IBS scientists, the exhibition was accompanied by public talks and a voting system. In many of his paintings Van Gogh used curly lines which resemble fluid dynamical turbulence. Confined in an asylum in southern France Van Gogh painted even a calm starry night sky with such dramatic elements to express the hidden powers of nature. 128 years later, scientists from the IBS Center for Climate Physics in Busan take a different perspective on the lurking and destructive forces of nature. The team calculated the global climate evolution by solving complex mathematical equations and about 2 million lines of computer code on one of the world’s fastest supercomputers. In their simulation the scientist can track to development and movement of hurricanes in great detail, as shown in Figure 1 which shows the interactions of two hurricanes circulating over the Indian Ocean with a meandering wind jet to the south. “Hurricanes, also called typhoons or tropical cyclones, are feared for their destructive power, but when simulated on computers they exhibit unprecedented natural beauty,” explain IBS Center for Climate Physics (ICCP) researchers Seung-Bu Park, Sun-Seon Lee and Jung-Eun Chu, creators of ‘The Stormy Night’. To produce these images, IBS scientists captured the dynamics of atmosphere, ocean, land, and sea-ice systems with a resolution of about 25 kilometers. Climate computer models can also help to determine how future global warming will impact hurricanes and related future extreme rainfall events and flooding. ▲ Figure 2ICCP director Axel Timmermann giving a talk to high school students at the exhibition Art in Science 2017. “As a hurricane can reach speeds of 200 kilometers per hour, it would feel like sticking your head out the window of a fast train,” explains Timmermann. However, simulating hurricanes is only one of the interesting tasks undertaken by ICCP. Founded on January 1st, 2017, the Research Center aims to study climate phenomena in all their complexity: “Understanding natural climate variability and man-made climate change can improve the ability to predict climate impacts on the hydrological cycle, ice-sheets, sea level and regional processes,” explains ICCP director Axel Timmermann. Recently, the center also hosted the Climate Change and Human Migration conference. The five-day event attracted local and international experts in paleo-climate, paleo-genetics, water management, climate economics, human rights, sea level rise, food security and climate justice, to discuss issues connected with climate-induced migration. As our ancestor’s dispersal across our globe was partly orchestrated by changing climate, vegetation and food conditions, so will global warming and sea level rise impact the living conditions and food security of our next generation. It has been estimated that over the next 30 years environmental changes will create several hundred million “climate refugees”. Global environmental changes have also been the centerpiece of the exhibition on “Environment, Conflict, and Cooperation”, which was hosted by the Germany Embassy during the conference. 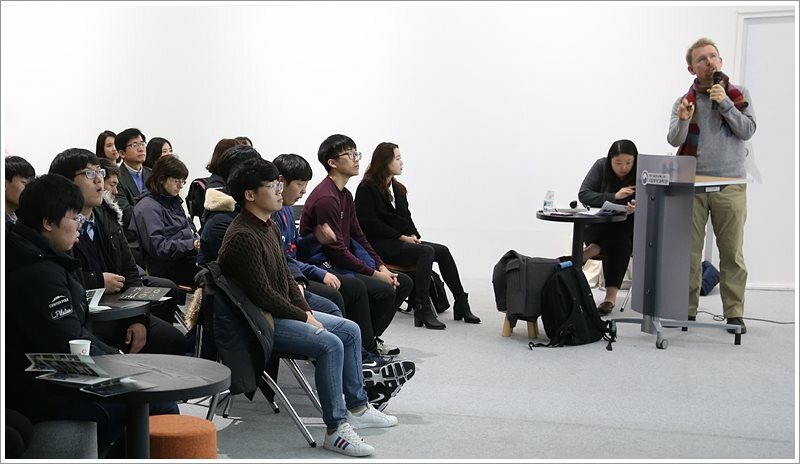 As South Korea is also facing major challenges due to future climate change and ocean acidification, ICCP has taken dialogue with youth as one of its goals. 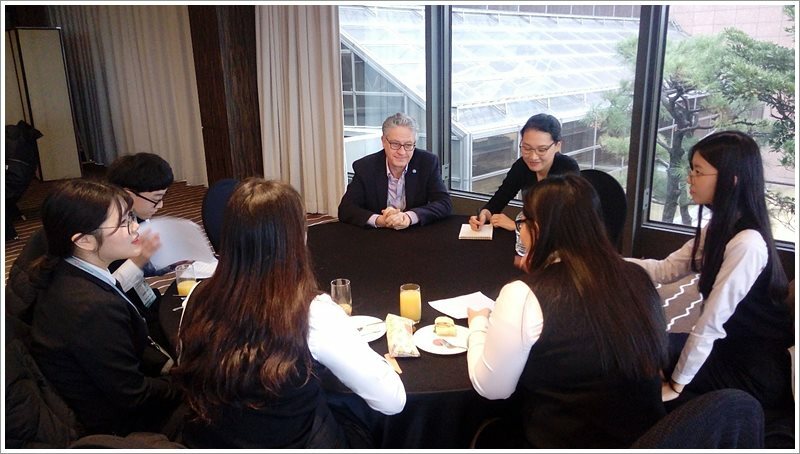 During the conference, high school students from Busan had the opportunity to ask questions to and engage in a dialogue with leading international climate change experts. “Economic success is pleasurable only in a healthy environment,” stressed Thomas Stocker, professor at the University of Bern, at the students-meet-experts special session. ▲ Figure 3Students-meet-experts session at the IBS Climate Change and Human Migration conference in Busan.